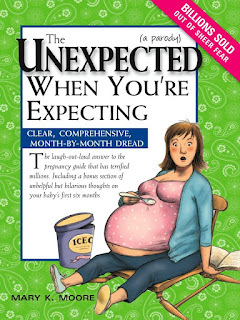 Tomorrow I am attending a Baby Shower, which reminded me that I needed to write a review on this book "The Unexpected When You're Expecting". The quick summary of my review is "This book is HI.LA.RIOUS! - you should read it!". When I first got asked if I'd want to review this book, my first thought was "oh, I am not planning to get pregnant again, why should I?". But when I saw the cover of the book, my interest got me and I agreed to read the book. The publisher mailed the book to me quickly, I received it an a couple of days. It was a Thursday when the book arrived at my doorstep. Because that's the day I take my son to the library for tutorial, I grabbed the book and took it to the library with me to start reading it there. THAT WAS A MISTAKE! Just reading the few pages of this book, I started giggling, then laughing. I wanted to laugh out so loud, but for goodness sake I was in the library and I was supposed to be quiet - so I tried to control my laughter. Oh, you can just imagine me with my hands covering my mouth and I was shaking because I was laughing inside! The people around me probably wondered if I was getting possessed or something. The more I try to control my laughter, the more I laugh. I highly recommend this book. Since I am done reading it, I am going to give this to my friend who is having a baby shower tomorrow and I am sure she'd get a kick out of this. Better yet, we should read it out loud during the baby shower for great fun! We'd probably pee on our pants laughing - LOL! I was very delighted to read that my bloggy friend, Jamie of the Blondemomblog, was able to interview Mary K. Moore, the author of this book. Go there now to read the interview. I am sure you would enjoy it. I also suggest that you visit Mary K. Moore's website here. Have fun! Wasn't it hilarious!? Six, yes now SIX women at work (well the latest is the wife of a guy I work with) are pregnant. I sent it to one of my co-workers who is on bedrest. I know she needs some laughter while she's in the hospital! Looks like a great book. I'll try to find a copy of that one here in Singapore.